Afghan Taliban militants stand with residents as they took to the street to celebrate a cease-fire on the outskirts of Jalalabad, June 16, 2018. The Afghan Taliban attacked security forces in at least nine provinces Monday, making good on a threat to resume fighting, even as the government extended by 10 days a unilateral cease-fire. “The cease-fire was violated in some parts of the country, during which 12 of our soldiers were martyred by Taliban,” Gen. Mohammad Radmanish, spokesperson for the Afghan defense minister, told VOA. “At least 30 Taliban insurgents were either killed or wounded during the skirmishes,” he said. The Taliban had warned in a statement that the initial three-day cease-fire would end Sunday. “The three days of cease-fire made it clear that the Afghan people are supporting the armistice and the peace process that is also backed internationally … We are looking forward to Taliban's responding to it positively and ending the violence,” Shah Hussain Murtazawi, spokesperson for Afghan President Ashraf Ghani, told VOA. The NATO-led Resolute Support Mission and U.S. Forces-Afghanistan supported Ghani's extension of the cease-fire with the Taliban and offer to begin peace talks. 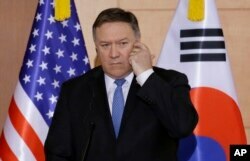 U.S. Secretary of State Mike Pompeo listens to a question during a joint press conference with South Korean Foreign Minister Kang Kyung-wha and Japanese Foreign Minister Taro Kono following their meeting at Foreign Ministry in Seoul, South Korea, June 14, 2018. A period of 10 days does seem considerable, said Afghanistan expert Walter Dorn, a professor at Royal Military College of Canada & Canadian Forces College. “Some Taliban fighters abused the cease-fire, but the overall Taliban movement might shift toward peace,” Dorn added. The leader of Taliban fighters, Mullah Hibatullah Akhundzada poses for a portrait in this undated and unknown location photo. While the Afghan government is still trying to bring the Taliban to the negotiation table, the insurgent group has once again called for direct talks with the United States. 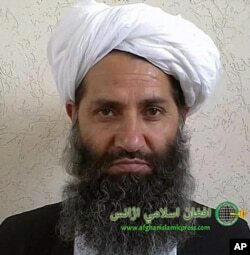 “If the American officials believe in a peaceful end to the Afghan conflict, then they should present themselves at the table of direct talks so that the illusion of aggression be ended, which harms the Afghan and American people,” Taliban leader Hibatullah Akhundzada said in a statement issued on June 12. U.S. officials have always denied engaging in any talks with the Taliban; however, former U.S. Ambassador to Afghanistan James Cunningham said he believes the U.S. should talk with the Taliban but not exclude the Afghan government. “I personally think we should talk to them. We have an obvious role to play in Afghanistan. We need to make clear to the Taliban what that role is, what our vision to the future is, but not at all to the exclusion of or instead of the Afghan government. They must talk to the Afghan government.” Cunningham told VOA. “The necessary interlock to end the conflict is the Afghan government, not the United States or the coalition. But I think we open a discussion with them in complete transparency in Kabul because our views and our voice are going to be an important part of the discussion,” he added. The Afghan High Peace Council (HPC), the body tasked with bringing the Taliban to the negotiation table, welcomes all the support for an Afghan-owned and Afghan-led peace process. “We ask the Taliban to respond to the Afghan people’s peace call and to engage in talks with the Afghan government before asking any other country for talks,” Syed Ehsan Tahiri, HPC spokesperson, told VOA. “Any measure that undermines the Afghan leadership and ownership of its peace process is unacceptable to the Afghan High Peace Council,” he added. Najiba Khalil of VOA Afghan Service contributed to this report.